A classic playground game, Jacks has been enjoyed by children for hundreds of years. Now its time for a new generation to discover the fun! 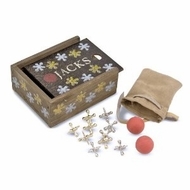 The Melissa and Doug Jacks Set includes five silver and five gold jacks, as well as two rubber balls. Store the set securely in a handy suede-like pouch that fits neatly in an heirloom quality solid-wood box with a sliding lid! A detailed instruction booklet is included.